One of the legendary campaigns of the Civil War. Sherman's armies eschewed actual combat but waged a fierce psychological war in the heart of the Confederacy. Rebel general Richard Ewell claimed that "the road to glory cannot be followed with too much bagage." Oddly enough, Sherman's supposedly stripped down columns marched toward Savannah and glory with close to 6000 wagons and ambulances. Map Image: 23.5" x 36"
Overall size: 24.5" x 38"
Other Map images: Detail map of Fort Mc Allister and environs, a detailed map of the Griswoldville Battlefield, and a theater map showing the areas of Sherman's marches from Chattanooga to Atlanta, on to Savannah and to the surrender at Bennitt Place, North Carolina. 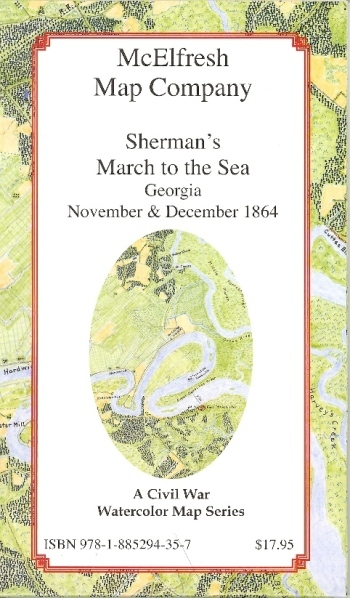 Reverse Side: Full color reproduction of four contemporaneous maps either prepared for or used by Union forces in Georgia in 1864. Also, informative captions and a striking wartime photograph of the principal Union mapmaker on the march, Orlando Poe.